Orthodontics is the practice of straightening teeth. When teeth are crooked, crowded or misaligned, orthodontic treatment is used to achieve an occlusion, or perfect bite. Through various orthodontic appliances, pressure is continuously applied to move teeth into the correct position. Since so few of us actually have perfectly aligned smiles, just about everyone can benefit from an orthodontic exam. It is highly recommended that your children receive an orthodontic consultation by the age of 7. No matter what age you are, orthodontics can help just about anyone! 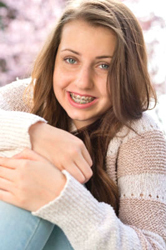 Orthodontics may be easier for children and teens, as their jaws are still developing and teeth are easier to move. But for adults who suffer from a malocclusion, or imperfect bite, it's never too late to seek orthodontic treatment.